This is a new, exciting fish. These are the only ones I have ever seen. 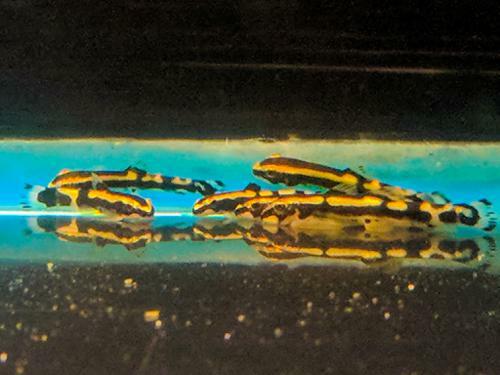 They appear to be a color variant of the popular Panda Loach or perhaps a new, but closely related, species. They are small, colorful, peaceful fish that like to graze on every surface in the aquarium throughout the day. Being a new fish, I don't have much experience with them, but they do seem to be hardy if they are kept in clean, well oxygenated water. I have not noticed any signs of illness in any of them. These are eating well on Repashy, flakes, pellets, frozen, and live foods. They are not picky and eat pretty much anything that lands on the bottom of the aquarium, leaves, logs, or other surfaces. This species needs lots of dissolved oxygen in the water, so be sure to provide adequate aeration/water movement. They are a temperate species best kept in the 60'sF to mid-70'sF. They can be kept warmer, but care needs to be taken that their is plenty of dissolved oxygen at higher temperatures.